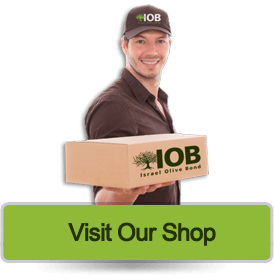 Many legends and proverbs have been written about olive oil: “Just as this oil does not mix with other liquids, so Israel does not mingle with the peoples of the world. 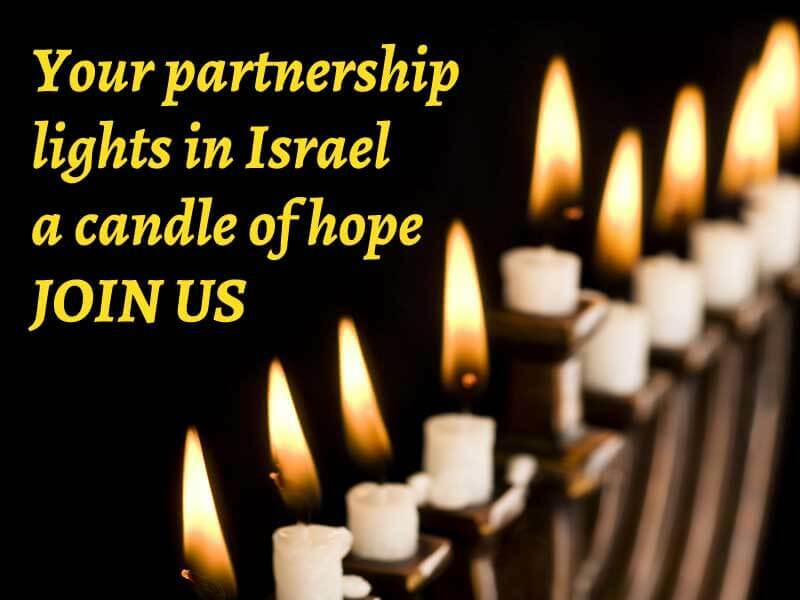 Just as the oil brings light to the world, so Israel is a light unto the world. As it is said, let the nations walk in your light. Just as oil is the highest of the liquids, so Israel is the highest of the peoples” (Song of Songs 28). Morocco. Olive oil was sent to a barren woman in the Diaspora in the form of the memorial candles that are lit in memory of holy men, and she conceived and bore a son. 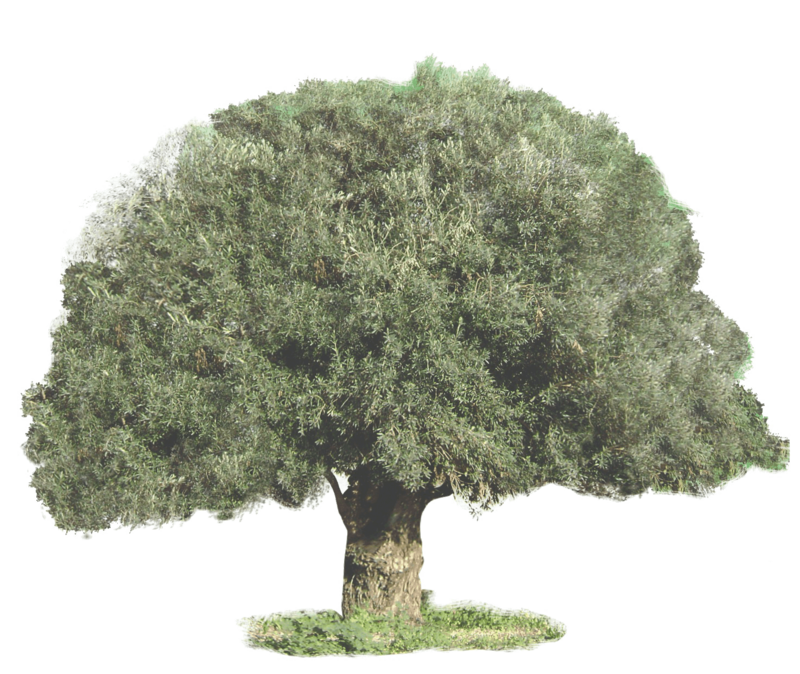 Offerings: Those who came to the Temple would sacrifice on the altar offerings of grain, new wine, and yitzhar – pure oil. Today there is still a symbolic representation of the harvest brought to the Temple as an offering in the Friday night (Sabbath evening) meal, when Jews place on the table two loaves (grain), wine, and candles (oil). 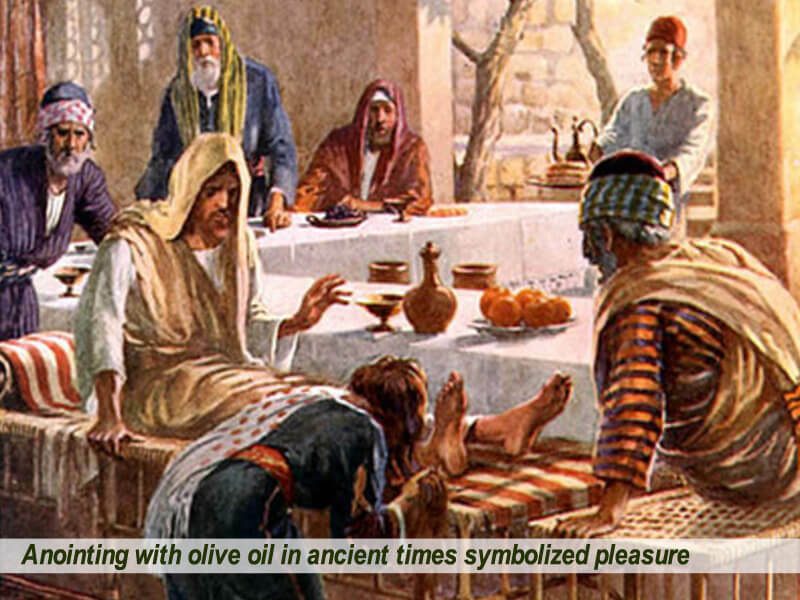 Oil for Anointing: Anointing with oil in ancient times symbolized a life of pleasure and happiness; a special form of anointing symbolized particular honor, purification, and holiness. The patriarch Jacob blessed the stone that had been his pillow and set it up as a memorial by pouring oil over it (Genesis 28:18). Later in the same place, God spoke to him and Jacob again poured oil on a stone pillar (Genesis 35:14). 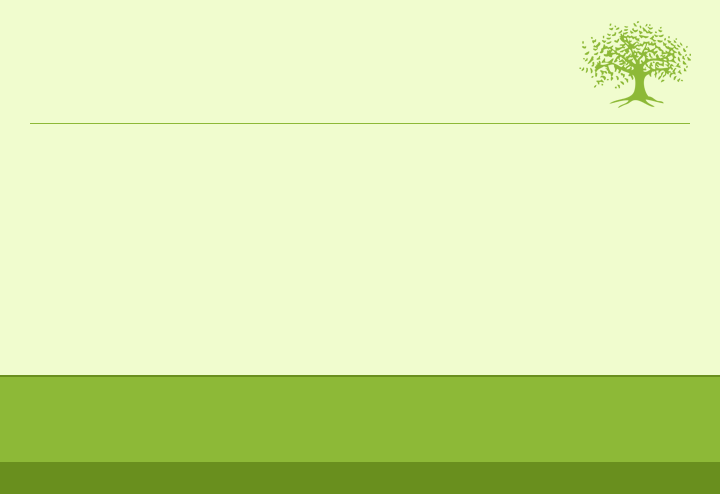 By this symbolic act he set aside that place, which he called Bethel, as holy. Anointing was presumably a well-established practice even at that early date. being commanded by God to prepare holy oil with a specific composition for the anointing of the tent of meeting, the Tabernacle, and all its contents. The furniture and utensils were thereby consecrated “that they may be most holy; whatever touches them will become holy” (Exodus 30:29), and Aaron and his sons were also anointed “that they may serve me as priests” (Exodus 30:30). In Leviticus 8:10-11 we find Moses putting this into practice, with the altar itself being anointed seven times. Furthermore, Moses had to warn the people of Israel of its holiness: “It shall be for you most holy. And the incense which you shall make according to its composition, you shall not make for yourselves; it shall be for you holy to the Lord. Whoever makes any like it to use as perfume shall be cut off from his people” (Exodus 30:36-38). From the anointing of the priest it was a simple step to the anointing of the king or of the king-designate. “They anointed David king over the house of Judah” (2 Samuel 2:4; see also Judges 9:8-9; 1 Kings 1:34); and prophets, such as Elisha (1 Kings 19:16). Anointing with holy oil symbolized that the king was the choice of the God of Israel: “He is the Lord’s anointed” (1 Samuel 24:6). 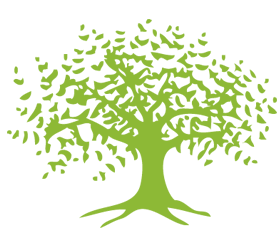 The Hebrew word for “anointed,” mashiach, is the origin of the word Messiah. Tithes: “This shall be the priests’ due from the people, from those who offer a sacrifice, whether it be ox or sheep, that they shall give to the priest the shoulder, and the two cheeks, and the maw. The first fruits of your grain, of your new wine, and of your oil, and the first of the fleece of your sheep, you shall give him.” (Deuteronomy 18:3-4). The offering was a gift, the best of the harvest donated for the holy needs of God and the priests. 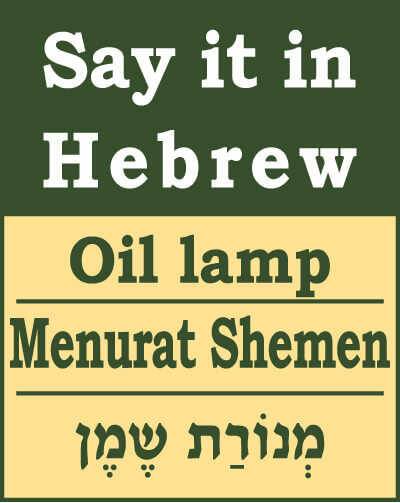 Olive oil candles have been part of Jewish tradition throughout history. 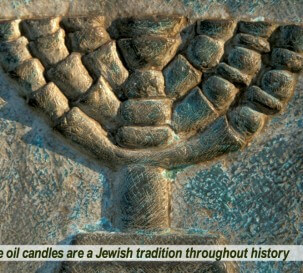 The lighted candle was the sign of life in an ancient Jewish home. 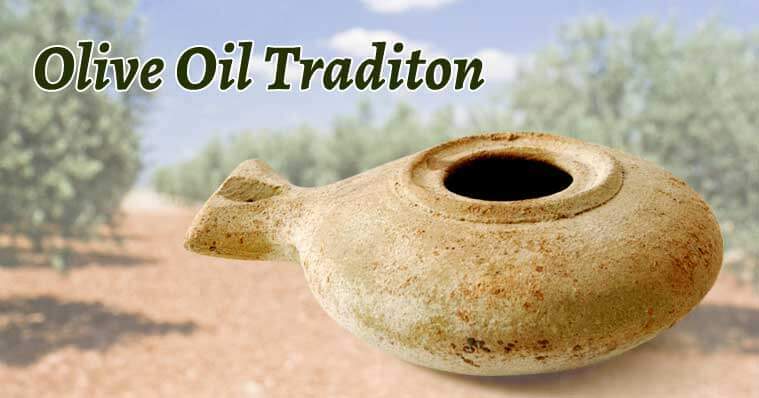 The first evidence of oil candles in Israel appeared 4,000 years ago. Nearly every archeological dig in Israel finds candle holders. The people were especially strict about the Sabbath candles. 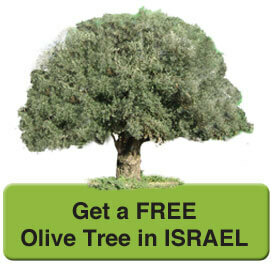 From the dawn of Jewish culture it was the custom for Sabbath candles to be made only of olive oil. The holy atmosphere of the Sabbath as expressed in the family meal, characterized by pleasure, peace, tranquility, and pleasantness, was bathed in the light of olive oil candles. 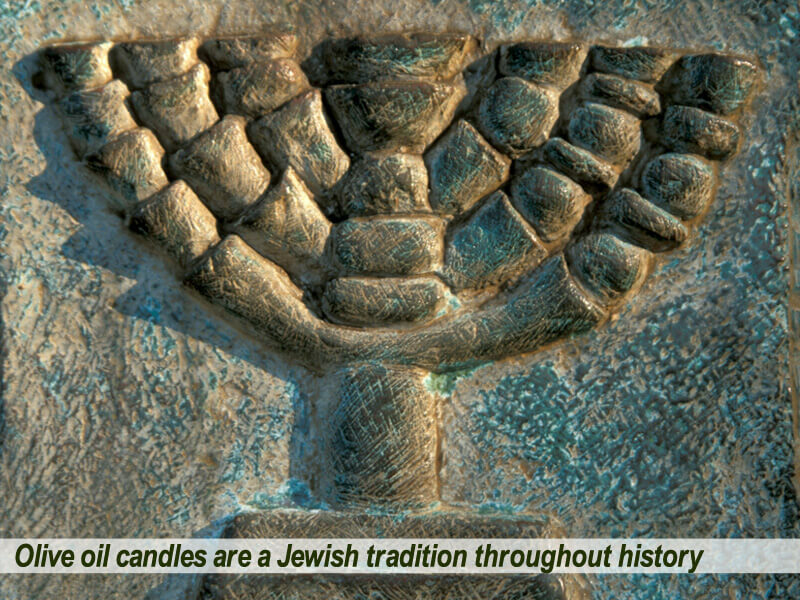 Jewish tradition also found a parallel between the Sabbath candles and the eternal lamp in the Temple. 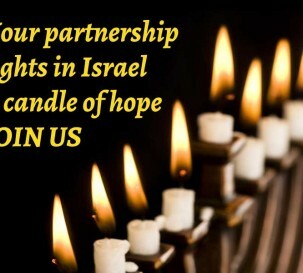 Lighting the candles on Hanukkah symbolizes the renewal of lighting the Temple lamp. 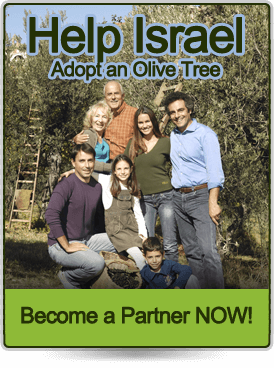 Hanukkah occurs in the month of Kislev which is also the month of the olive harvest, a fact that illustrates the breadth of the symbolism linking the people, its land, and the Temple.